Although it was somewhat of an underdog when it arrived in October 2009, Borderlands quickly became a hit among PC and console gamers alike, selling over 4.5 million copies and propelling Gearbox Software to new heights. Despite complaints about repetitive gameplay and finicky menus, fans loved the title's unique comic-like art style and its seamless mashup of the first-person shooter and role-playing genres. 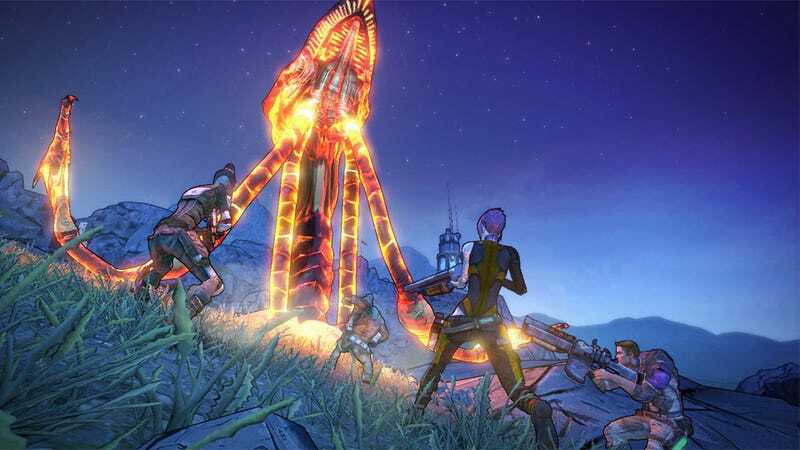 Considering the success of its first entry, it came as no surprise when Gearbox revealed plans to produce a sequel that would address Borderlands' shortcomings while expanding on its strengths. As you're very likely aware, that follow-up launched to critical acclaim this week, earning a Metacritic score of 89 out of 100 on PC (even higher marks for the PlayStation 3 and Xbox 360 versions at 92 and 90, respectively). Based on reviews we've read, Borderlands 2 succeeds at building on the foundation laid three years ago, delivering an improved menu system, revamped skill trees, new characters, more weapons, smarter foes, and the same addictive loot-driven co-op first-person shooter action. As exciting as all of that may be, we're more interested in seeing how the game runs on the finest PC hardware from Intel, AMD and Nvidia. Built on a highly modified version of Unreal Engine 3, the game only uses DirectX 9, opting to exclude the engine's DirectX 11 support. It's worth mentioning that Borderlands 2 is a "The Way It's Meant to be Played" title, supporting many Nvidia features such as PhysX and 3D Vision Surround. In other words, we wouldn't be surprised if Nvidia's cards maintain a noticeable performance lead throughout our review. We'll test 26 graphics card configurations from AMD and Nvidia across all price ranges using the latest official drivers for every card. Our test bed will feature an Intel Core i7-3960X to remove any CPU bottlenecks that could influence high-end GPU scores. We'll use Fraps to measure frame rates during 90 seconds of gameplay footage from Borderlands 2's second level, "Southern Shelf." The test begins at the start of the level and here the frame rate is quite high as there is little scenery. However, the frame rate quickly dives as the player walks out into an open area and battles some Brat Bullymong. When running Borderlands 2 at 1680x1050, we found what looked like a rather severe CPU bottleneck — a surprise given that we're using the Core i7-3960X. The frame rate would spike to around 120fps with the higher-end cards, however, out on the ice ledge where the majority of the test took place, the frame rate was limited to 75fps. As a result, the top 10 graphics cards starting with the GTX 480 were limited to an average of 75fps. The older HD 6970 managed 73fps, a frame rate the GTX 560 Ti also managed to achieve, despite usually being slower than the HD 6970. Similarly, the GTX 460 kept pace with the HD 6870 and 6850. Again, this is a "TWIMTBP " title. What we can take away from these results is that at 1680x1050, only very modest GPU power is required as all graphics cards averaged more than 35fps, while most of the affordable cards managed a decently playable 50fps or so. The CPU bottleneck is less apparent when playing at 1920x1200, as the GTX 680 and GTX 580 both averaged 74fps while the GTX 670 and GTX 660 Ti were a fraction slower at 73fps. The HD 7970 tied the GTX 660 at 72fps while the HD 7950 was slightly slower but still sitting comfortably at 70fps. At the other end of the graph, we see that the HD 6770, 7750 and 6750 all struggled with around 30fps, which really isn't enough for playable performance in our opinion. That said, the HD 6970 and GTX 550 Ti looked much healthier, rendering almost 40fps — not ideal, but every frame counts here. Beyond the GTX 550 Ti, most cards didn't have much trouble delivering playable performance at 1920x1200, but again, unsurprisingly, Nvidia's cards performed the best. The old GTX 460 mustered an average of 49fps, making it almost as fast as the HD 7850, AMD's $220 mid-range enthusiast card.